The Israeli-Palestinian Peace meeting announced for the Autumn of 2007 in Annapolis, Maryland, is the brainchild of Secretary of State Condoleezza Rice. According to all indications, she conceived of it, has nurtured it, and, one could argue, is the only one who really believes in it. However, most pundits and analysts, as well as Israelis and Palestinians, are immensely skeptical — even cynical — about the meeting’s chances for anything but failure or, at best, continued stalemate. However, Rice is not naïve, nor is she tone-deaf. The country she represents is the single most important economic and military force on the globe and, despite a weakened image and divided polity, can still project political power in the world and in the Middle East as well. Thus, statesmen and politicians have little choice but to take the meeting seriously, despite their barely-concealed skepticism. Much of the world now views a settlement of the Israeli-Palestinian conflict as an indispensable prelude to dealing with many of the other conflicts in the region, including the global Islamist crisis. Thus, for this reason and others, and unlike the failed Camp David summit of July 2000 whose shadow hangs heavily over Annapolis, this meeting is not just about that conflict. The events since Camp David, including the 9/11 attacks and its consequences; the Afghan War; the Iraq War and continuing insurgency; the growth of Islamism and Islamist-related violence; the increase of anti-Americanism to unprecedented levels; the failure of “transformational diplomacy” to lead to democracy in the Middle East; in addition to the rise of Iran, its vehement anti-Israel stand and its quest for nuclear capacity, have raised the stakes considerably. In fact, the meeting itself, it is increasingly suggested, could well be a thinly disguised cover for the creation of a tacit Middle Eastern anti-Iran axis, encompassing Saudi Arabia and the Gulf States, Egypt and Jordan and, unprecedentedly, Israel and the proto-state of Palestine. The summit arrives at a time when Israel is forced to rethink the entire strategic model that has guided it since its establishment. Until now, Israel counted on being able to defeat any threat to its existence, either through its armies preventing or defeating invasion (1967, 1973) or through the quick and effective destruction of potential nuclear threats (Iraq’s Osirak reactor in 1981; perhaps Syria this September: see sidebar on page 8). However, the threat of Iranian nuclear capability, the missiles that fell on Israel during the 2006 Lebanon War, and Syria’s recently expanded missile capability all combine to make Israel less sure that it can prevent an attack on its population centers. Thus, Israel is forced to confront the question as to whether it can either trust its neighbors and/or create a system of “balance of terror,” similar to the system that worked for the US and the USSR in the Cold War. This will not be addressed directly at Annapolis since the Palestinians are not now a strategic threat in this sense, but it is part of the context in which it is taking place. Israel also fears that an independent Palestinian state would quickly acquire the capability to rain missiles on Israel, as Hizbullah already has. Perhaps of equal importance will be the effect on the standing of the United States on the world stage. The US always has been understood, by friends and enemies alike, as the indispensable outsider in the Israeli-Arab conflict. The refusal of the Bush Administration during its nearly seven years in office to use its power and influence to encourage, or even induce, an effective peace process has precluded any hope of settlement since the Taba negotiations of 2000-1. Meanwhile, American involvement in the Middle East — not only its troops in Iraq but also, most notably, its attempts to prevent Iranian nuclear capability and the barely veiled threats of attack that accompany it — have both magnified America’s profile, and tarnished its image. The failure of this meeting would embolden those who see the US as a paper tiger — not only Iran and the various strands of the Islamist movement, but also Russia, China, and even North Korea, most recently accused of illicit involvement in Middle Eastern nuclear proliferation. The differing and often conflicting agendas of each of the parties and interested observers, both friendly and hostile, will be examined below. It should be noted that this meeting is a moving target. This Policy Brief is intended as a guide and analysis as the meeting approaches. Israel officially embraced the proposal for a meeting and, as a close US ally, was presumably involved in its formulation. However, most Israelis, at all levels of political power, are highly skeptical of it and feel that its timing is absurd. While having reduced the threat of suicide bombing considerably since 2002-03, Israelis feel actively threatened by the continuing Qassam rocket attacks from Gaza; Hamas’ firm and exclusive control of Gaza; Hizbullah’s continuing threat from Lebanon; and the possibility of war with Syria, which seemed very real in the summer of 2007 but now appears to be receding. But most threatening of all, Israelis see Iran as a strategic threat, primarily because of its drive to acquire nuclear capability. Israelis take seriously Ahmadinejad’s repeated threats to “wipe Israel off the map,” as well as Iran’s support for Hamas and Hizbullah. Israelis, though actively supporting Mahmud ‘Abbas’ government in the West Bank and heralding him as a peace partner, are privately very cynical of his ability to bring the majority of Palestinians into a viable peace settlement and, concurrently, to isolate and weaken Palestinian rejectionism, most notably Hamas. Many Israelis see most Palestinians as ultimately bent on destroying Israel as a Jewish state whether for nationalist or religious motivations and thus find it difficult to believe that this intention could abate or disappear, especially after their experiences of the last seven years and the clear evidence of ‘Abbas’ weakness and Hamas’ strength. Meanwhile, Israel has significant political problems and ideological divisions that make its own peace posture problematic. First, the country lacks strong leadership. Israelis joked bitterly that a few months ago that Prime Minister Ehud Olmert’s popularity, at 3%, was within the statistical margin of error. While his popularity has risen somewhat to about 20%, he is simply not trusted by most Israelis, based on his handling of the 2006 Lebanon War, the financial scandals swirling about him, and uncertainty about where he wants to lead the country. His ascent to the prime ministry was due only to the incapacitating stroke suffered by his predecessor, Ariel Sharon, and he leads a party (Kadima) that is widely expected to disintegrate whenever new elections are held. Thus, he remains in power largely because his supporters in the Knesset do not want to leave their jobs and, perhaps equally important, because there is no strong and popular leader who is seen as a generally acceptable replacement. Israel has always been riven by ideological splits — perhaps never more than now — and some extend into the coalition government itself. Perhaps 25-30% of Jewish Israelis, who are largely, but by no means overwhelmingly, Orthodox and Haredi (“ultra-Orthodox”), believe that Israel must hold onto the West Bank for theological reasons and additionally that Palestinians and Arabs in general would never accept Israel, no matter what it does for peace. The fringes of this group are believed to be willing to engage in violence to prevent the evacuation of the settlements, perhaps more severe than was seen when the Gaza settlements were evacuated in 2005. Any leadership working towards peace would have to contend with this significant opposition in the country at large. Of more political importance are the doubts of the center and center-right of the Israeli population. They do not reject peace; in fact most would like to experience it. However, as noted above, they are deeply skeptical about Palestinian, Arab, and Muslim desires for peace without the destruction of Israel. Many of this group supported the Oslo peace process of the 1990s, but were decidedly disillusioned by 1) the failure of Camp David, which Israelis overwhelmingly blame on Palestinian intransigence; 2) the subsequent Intifada and the suicide bombings that were part of it; 3) the victory of Hamas in the Palestinian elections of January 2006 and its later takeover of Gaza; 4) the strength of Hizbullah in Lebanon and the damage it inflicted on Israel in the Lebanon War of 2006; and especially, 5) the continuing rocket attacks from Gaza on Israeli towns and facilities nearby. Israelis tend to take many of the extreme statements by anti-Israel forces as representative of “real” Palestinian desires and cannot see the growing support for Islamism as anything other than a clear barometer of support for the destruction of Israel. Thus, even those who genuinely support the concept of a two-state solution are skeptical of the possibility of implementing it now or in the next few years and feel that continuing military control of much of Palestinian life may be essential for Israel’s survival. Some reach this conclusion with genuine reluctance; for others it is self-serving, as it can be used to justify continuing settlement activity and to avoid facing the internal divisions that would be part of a peace settlement. Olmert is seen as a centrist and, despite his right wing political origins, as a pragmatist (some would say opportunist). He has increasingly talked about “painful compromises.” In a televised speech at a forum organized by the Washington-based Saban Center in Jerusalem, he said Israel was ready to put “all basic questions, all the substantive problems, all the historical questions” on the table at the meeting. This statement is unprecedented. “History,” presumably referring to Palestinian claims since the creation of Israel in 1948, which the Palestinians call the Nakba (catastrophe), always has been excluded from negotiations by Israel before this. It is possible that he can envision an agreement that would involve the creation of a Palestinian state on 95% or more of the West Bank, with swaps (even 1:1) for Israeli territory (perhaps some with Israeli Arabs living in it, which would both relieve Israel’s “demographic problem” and create outrage among its Arab citizens), but it is difficult to see how he could sell it to the Knesset and to the country as a whole. The Israeli nightmare is rocket attacks from a Palestinian state close to Israel’s heartland, and much of the West Bank is that close. It is difficult to believe that Prime Minister Olmert could survive the political storm that would erupt should he seem to be willing to agree to what Palestinians state are their minimal demands. Olmert’s governing coalition is fragile, like most Israeli governments. For a full-scale peace deal, he could probably count on the support of the Labor Party (19 seats) and perhaps 2/3 of his own Kadima party (20 out of 29). Presumably he could get the support of the Pensioners Party (7). However, the two more right wing components of the coalition, the Sephardi ultra-Orthodox party Shas (12 seats) and Yisrael Beitenu (11), largely composed of Russian immigrants, might well balk. Shas has threatened to leave the coalition if Jerusalem is divided. Yisrael Beitenu might accept a partial division of Jerusalem, and would rejoice if Israeli Arabs are moved out of the country; however, they would be highly skeptical of full-scale peace. Olmert would presumably also get the support of the three primarily Arab left-wing parties, Ra’am-Tal (4), the National Democratic Assembly (3) and Hadash (3), plus the Zionist leftwing party Meretz-Yahad (5), all of which are in the opposition. This count would give him approximately 62, though that figure is admittedly approximate and unscientific. Although a simple majority, it would be politically very problematic for Olmert to rely on the Arab-dominated parties to provide the margin for passage. Israel is insisting on a pre-meeting document that would state in general terms the parties’ desire for a two-state solution. This would presumably be implemented when Israelis feel more secure. The problem though, as Olmert and his advisors must realize, is that it is virtually inconceivable that Mahmud ‘Abbas or the leaders of the other Arab countries would come to a meeting where such a non-specific proposal was on the table. The only possible avenue for breaking this impasse might be setting up a continuing process to immediately follow the summit. This has been suggested by ‘Abbas, with a demand for a six-month deadline, and has already been rejected by the US. That is Olmert’s dilemma: he is stuck between a fearful and anxious electorate and divided coalition on the one hand, and moderate Palestinian leaders who must prove to their people now that their moderate and peaceful methods are more effective than Hamas’ militancy on the other. Palestinians can justly claim that their plight has never been more desperate. The estimated 1.5 million Palestinians in Gaza are literally under siege, with only essential commodities being allowed in. The Hamas government is being boycotted by most of the non-Muslim world until it agrees to three conditions: recognition of Israel; acceptance of previous agreements; and a renunciation of violence. Hamas refuses, contending that nonvio­lence has failed and Israel will only respond to force. Primitive rockets manufactured in the West Bank are launched regularly into Israel from Gaza, occasionally hitting a target, and Israel retaliates with small raids. A full-scale Israeli attack on Gaza has been expected for months. The West Bank is in somewhat better shape. Since President ‘Abbas expelled Hamas from his government after it took over Gaza, Israel has embraced him and allowed him to receive tax revenue that had been frozen, while international aid became much more available. Fatah’s popularity among Palestinians rose somewhat from 43% in June to 48% in September, while Hamas’ fell 2% in the same period from 33 to 31%. However, Abbas’ forces only control parts of the West Bank, mostly urban areas, though those areas comprise about 97% of the Palestinian inhabitants. Palestinian movement is severely curtailed by 47 permanently manned checkpoints within the West Bank, plus 408 “physical barriers,” according to the Israeli human rights organization B’tselem. The so-called “security barrier” (a wall according to Palestinians, while Israelis call it a fence; in fact it is both, in different places) cuts many Palestinians off from their land and makes entrance into and exit from the West Bank extremely difficult. The barrier also cuts off 11.9% of the West Bank (including Jerusalem) from the rest of the West Bank, including areas technically on the Palestinian side but which are surrounded by the wall. The economy is functioning, but only with considerable foreign support. In the political sphere as well, Palestinians are in unprecedented disarray (See sidebar). President ‘Abbas supports the boycott against Hamas and Gaza, though government spokesmen privately acknowledge that sooner or later they will have to negotiate with Hamas and there are reports that secret negotiations are already taking place. President ‘Abbas feels he has little time to prove to Palestinians that his path of renouncing violence and negotiating with Israel can provide a state with its capital in Jerusalem and a relief from Israeli checkpoints as well as freedom for Palestinian prisoners. He is reportedly very pessimistic about the chances of a successful conclusion to the summit, but needs to salvage his position in the aftermath. Hamas opposes the Annapolis meeting, and disruption through terrorist action is feared from them or from other, more radical Islamist groups, with support from Iran. After several months of comparative quiet in Gaza, significant violence broke out on about November 12. Hamas opened fire on a large Fatah rally commemorating the third anniversary of Yasir ‘Arafat’s death, killing seven people. Israeli analysts suggest that Gaza has now moved into the control of a more militant faction, sidelining Ismail Haniyya, who has been a prominent and more moderate voice since Hamas won the January 2006 elections. There have been indications that Hamas is losing some support; concurrently Fatah has stepped up its sweep of Hamas supporters in the West Bank and intensified its verbal assaults on Hamas in every available forum. It may be that ‘Abbas has concluded that the approach of Annapolis, despite strong Palestinian skepticism, represents the best opportunity for a showdown with the Islamists. Palestinians have insisted since the Oslo Declaration of Principles in 1993 that they have already made their grand compromise in agreeing to a two-state solution, in which the future State of Palestine would encompass the 23% of historic Palestine which was ruled by Jordan from 1949-67 and is now known as the West Bank. But Palestinians insist that any further territorial changes must be 1:1 swaps, i.e., equal amounts of land (in quality and quantity) that was Israeli before 1967 must be traded for any land that is annexed to Israel within the West Bank. It is estimated that settlements are built on about 3% of the land in the West Bank, but own and control far more than that. As difficult as the issue of West Bank land is, the issues of Jerusalem and refugees loom even larger for many. The official Palestinian view of Jerusalem, since the acceptance of the two-state principle, is for a complete return to the 1967 borders. Nevertheless, it is widely accepted that on pragmatic grounds the leadership would settle for Palestinian areas of Jerusalem going to Palestine and Jewish areas to Israel. This would include the approximately 200,000 Israelis living in “new neighborhoods” (which the Palestinians call “settlements”) in Jerusalem on land that was Jordanian or “No-Man’s Land” until 1967. This division (or sharing) has traditionally been anathema in Israeli politics, but a recent trial balloon by Olmert’s Vice-Premier, Haim Ramon, calling for a recognition that Jerusalem must be divided if peace is ever to be attained, generated surprisingly little— but heated — opposition. But the main bone of contention will be the so-called “Holy Basin,” encompassing the holiest sites, including the Haram al Sharif/Temple Mount and the Mount of Olives, among other sites, which are holy to both Muslims and Jews, as well as to Christians. Various plans have been put forward for joint or separate control; all have foundered on the insistence of one or both of the parties that the sites must be under their sovereignty. The Right of Return is the Palestinians’ oldest and most fundamental demand, based on a narrative claiming that Israel expelled 700,000 Palestinians in 1948 and that simple justice, international law, and UN General Assembly Resolution No. 194 require Israel to allow them to return. Palestinians have always insisted that this includes their descendants, which brings the current figure to an estimated four million. Israel always has refused more than a token or “humanitarian” return at most, contending that the Palestinians fled voluntarily, that they were not expelled and, most fundamentally, that their return would necessarily spell the end of Israel as a Jewish state. Since the beginning of the Second or al-Aqsa Intifada (2000), Israeli opinion has hardened on this issue; most Israelis insist that not a single Palestinian should be allowed to “return.” Considering the issue closed, Israel has thus far refused to allow any discussion of the Right of Return in negotiations. But, as noted above, Prime Minister Olmert may be allowing it to be raised. There are ways to square this circle. Anyone who has spoken privately to Palestinian moderates, including the leadership, knows that there is a full recognition that Israel would never allow more than, at most, a token return. It is also assumed, with support from polls, that the vast majority of Palestinians would not actually wish to return, as long as they received compensation and resettlement, when necessary (especially the 300,000 in Lebanon, who are considered to be in the worst situation). However, Palestinians almost universally demand that there be a recognition of their catastrophe. It is increasingly recognized that this issue, like Jerusalem, is about principle more than numbers or land, and that the “Narrative of 1948” is an essential part of the national identity and legitimacy of both sides. Thus, if this issue is to be dealt with, let alone solved, acknowledgement of these two narratives must be part of it. One solution, for example, would separate the “Right” from the “Reality” of Return. This route is neither easy nor well-marked, but it can provide Palestinians with a recognition of their suffering while retaining Israel as a Jewish state. Like Israeli leaders, President ‘Abbas has to appease a fractious, angry, and also desperate constituency. ‘Abbas and his spokesmen are currently taking a hard line by insisting that their compromise already has been made and that they cannot go much further. They do not discuss the Right of Return, but simply reference UNGAR 194. It is unclear whether this means they do not see a compromise as possible or if they are setting out markers from which they will retreat slowly. A major change in the conflict since 2001 is the appearance of the Arab states, represented by the Arab League and led by Saudi Arabia, as participants in peacemaking. This represents a gradual though 180 degree shift in their position since 1967, when they still vowed that Israel must be destroyed, as they had since 1948. Saudi Arabia, site of the holy cities of Mecca and Medina, regards itself as the spiritual head of the Arab world and always has shied away from diplomacy in this conflict, preferring to leave it to others. Thus, the 2002 Saudi Peace Initiative (subsequently the “Arab Peace Initiative”) and its unanimous ratification by the Arab League was unprecedented. The Initiative offered full recognition of Israel by all Arab countries in return for a full withdrawal by Israel to the 1967 lines and “achievement of a just solution to the Palestinian refugee problem to be agreed upon in accordance with U.N. General Assembly Resolution 194.” (The probable translation here is no right of return since Israel would never agree to it.) Had it appeared two or three years earlier, it might have significantly affected the course of the Oslo process. Even apart from that, the timing was spectacularly bad. It was announced in the middle of the Intifada, at the height of the suicide bombings, which Israeli saw as proving the Palestinians’ fanaticism. Moreover, on the evening of the day it was passed, a suicide bomber killed 19 people at a Passover Seder in the Israeli city of Netanya. Israel responded with a massive, prepared response, reoccupying the Palestinian cities, and inflicting massive destruction. The peace plan barely created a ripple at that time. In succeeding years the plan has been examined more carefully by the US and Israel. Israel is not happy about the full withdrawal but considers it a promising start. Saudi Arabia also has made clear that it sees the resolution of the Israeli-Palestinian conflict on the basis of a two-state solution as a high priority. The reasons for this about-face are not hard to fathom. Saudi Arabia and the other conservative Arab states are under direct threat from both Sunni radicals like al-Qa‘ida and the Shi‘ite theocracy of Iran. Saudi leaders recognize that they have far more interests in common with a western-oriented state like Israel than with their own radical co-religionists for whom destroying the Saudi monarchy is a prime goal. Most Arab states have made some version of the same calculation. At this point, Israel is part of the landscape of the Middle East. Though they may not approve of Israel’s existence, either politically or theologically, they recognize that after 60 years of conflict and non-recognition, Israel is stronger and the Palestinians weaker. They also recognize that the Palestinian issue has a tremendous resonance in both the Arab and Muslim “street,” and that this is a significant component of the radicalization of recent years. The growth of religiosity, the dislocations and changes that Arabs and Muslims have experienced, their sense of powerlessness in a Western-dominated global system and, by no means least, the ubiquity of images from Palestine on Arab satellite TV channels all are destabilizing factors. Settlement of this conflict might be a major step towards stabilization in the region. Of course, there are constraints. Whatever the private views of Saudi or other Arab leaders might be towards Palestinians and their nationalism, they cannot be perceived by their people as having sold them out. The Arab Initiative echoes the basic Palestinian demands for a full Israeli withdrawal while trying to finesse the right of return. The Saudis, like the Palestinians, feel they have already done their compromising, especially since they have sweetened the deal with a promise of full diplomatic relations for Israel with the entire Arab world, an Israeli dream since 1948. The moderate Arab states generally see Iran as a significant threat: they are Sunni while Iran is Shia; they are Arab while Iran is Persian; they are Western-oriented, while Iran has set itself up as a challenger to Western, and especially American, hegemony. However, all are constrained in their support of the US by their populations, which to varying degrees strongly support the Palestinian cause, oppose the US, participate in the Islamic resurgence, and have some sympathy with Islamic radicalism. The Saudis much prefer behind-the scenes diplomacy and do not like being publicly pressured. Thus, they are particularly uncomfortable in their current role in the run-up to Annapolis. The Saudi monarchy has had a long and profitable relationship with the United States, and needs it to continue. Secretary Rice has made it clear that it is particularly important for the US that Saudi Arabia participate in the Annapolis meeting. The Saudis have made it equally clear that they would be happy to participate only if the meeting will change the situation on the ground, following the lines of the Arab League Initiative. This is where things have rested for several months. The Saudis see little likelihood of their demand being realized; on the other hand, they have no desire to publicly snub the United States. The promise of allowing billions of dollars of arms purchases by Saudi Arabia (as well as to Israel, the Gulf states, and Egypt), announced in August by Secretary of Defense Gates is also tempting; it is unlikely that the arms would be forthcoming if the Saudis did not appear. The Syrians have for many years been semi-isolated among the Arab states. Having cultivated a notably close relationship with the Soviet Union, Syria has never fully recovered from the USSR’s collapse. At odds with Iraq, it broke Arab solidarity by supporting Iran in the bloody Iran-Iraq conflict of the 1980s, and has retained a close relationship with Iran. At first blush, the countries could not have less in common. Syria is militantly secular, predominantly Sunni and Arab, while Iran is a Shia theocracy, aggressively articulating its Iranian (Persian) nationalism and historical antagonism to the Arab world, along with its demands for recognition as the regional hegemon. They have collaborated in supporting the Shia Hizbullah militia in Lebanon, which is politically pro-Syrian, theologically pro-Iranian and nationalistically (as well as theologic­ally) anti-Israeli. Syria has been proclaiming its willingness to make peace with Israel, for which the quid pro quo is understood to be the whole of the Golan Heights, captured by Israel in the Six Day (June) War of 1967. Simultaneously it has been improving and expanding its air defenses and shifting troops. There was a significant war scare during the summer of 2007, which seems to have lessened. However, a puzzling event happened on September 6, 2007, regarding which all countries involved have maintained an uncharacteristic silence (see sidebar). Recently, Secretary Rice said that Syria is welcome to come to Annapolis, and Syria has replied that it would only come if subjects of interest to it (i.e., the return of the Golan) were specifically on the agenda. Although the return of the Golan in return for peace now has considerable support in Israeli political and military circles, it is hard to imagine that it would be agreed upon in the current state of tension, given US coldness to the Syrian regime, as well as the political cost within Israel. Thus Syria, like Saudi Arabia, is also on the horns of a dilemma as to whether to come to Annapolis. It has recently been humiliated by Israel, whether or not the allegations are true. Yet, it fears further marginalization: It would derive significant economic and political benefits by improving its relationship with the United States and would demonstrate its eagerness for an honorable peace. Moreover, it presumably does want the Golan back. It has recently tried to improve relations with Saudi Arabia after years of estrangement, and it is unlikely that Syria would come if the Saudis do not. If the Saudis do accept the US invitation, then the Syrian dilemma is even more difficult. However, it would likely find it unacceptably humiliating to talk peace without a near-promise of the Golan, especially with the precedent of Hafez al-Asad (the current president’s father and predecessor) having abruptly left a peace conference in Geneva in 1999 with then-US President Bill Clinton and Israeli Prime Minster Ehud Barak when they were not willing to concede the whole of the Golan Heights, but reserved several hundred meters for Israel. It should be noted there is a school of thought in the US and Israel that views Syria as fundamentally tied to Iran and terrorism, uninterested in peace or rapprochement with the US or Israel, and for whom President Asad’s talk of “peace” is simply disinformation. Syria is opaque enough that such views can maintain traction. These two countries, the first Arab nations to sign treaties with Israel, have generally been at the forefront of peace efforts. President Mubarak of Egypt and King ‘Abdullah of Jordan met with Secretary Rice on her trip to the region during the week of October 15 and voiced support for the meeting. However, they appear somewhat subdued in their enthusiasm for the Annapolis meeting. In the last several years, King ‘Abdullah has voiced increasing concern about the ramifications of the continuing Israeli-Palestinian conflict and has urged action by the US. He can hardly sit on the sidelines now that his advice, even if belatedly, has been taken. However, Jordan may well be in the unenviable position, as it was in 1967 and 1990-91, of backing a policy it knows had little hope for success because it is not in a position to implement a successful one. Breaking with the US cannot be an option for the Jordanian monarchy. Jordan undoubtedly fears the instability that will result from a failed meeting, but the monarchy faces no serious or organized opposition, even if there are frequent rumblings of discontent and an Iraqi refugee presence that is a heavy weight on the country. The US-Jordanian symbiosis guarantees that Jordan will support the US and that the Americans will support the Jordanian monarchy should it need serious help. Egypt, as a larger, more powerful, and thus more independent country, has traditionally pursued its own perceived interest. This was the case when it signed a separate treaty with Israel in 1979, and explains its alternation of lukewarm and stronger support for the peace process over the last 28 years and, more recently, in its disregard for American demands for greater democracy, demands that have attenuated as American weakness became more palpable. Egypt would very much like a peace treaty to be signed, but can live without it. It is far enough from Iran not to be overly worried by it and is reported to be prepared to pursue its own nuclear option. Perhaps because it will be facing its own succession issues in the next few years, or simply because it does not expect success, it has kept a low profile in these matters. It will probably show up, but it is unlikely that President Mubarak is losing much sleep over the issue. In the last few weeks, Israel has warned increasingly strongly that Egypt is allowing an increase in arms smuggling from Egypt to Gaza. Egypt claims it cannot control it, but Israelis doubt that claim. In the last few years, Iran has emerged as the most vociferous state in rejecting Israel’s existence and supporting anti-Israel terrorism, concurrent with its drive for nuclear capacity. Both of these factors, plus allegations of support for anti-American activities in Iraq, have brought the US to issue only slightly veiled threats to attack Iran and destroy its nuclear facilities, though these are understood to be dispersed and hardened. Iran, of course, fully shares the view that it is the main target of the Annapolis meeting and, as noted, may well be correct. The Islamic Republic has denounced Annapolis as “a trap set by the Zionists." Hamas is of course not welcome at the meeting, though its presence is sure to be felt. There have been warnings issued of a “mega” attack by Hamas to disrupt it, though a spokesman has laughed them off, saying, “the conference is not worthy of any military activity by Hamas.” However, Israeli Minister Without Portfolio Ami Ayalon, a former head of Israel’s General Security Services (Shabak), has surprisingly urged that Hamas be invited to Annapolis. This is unlikely to happen. Thus, Hamas has no decisions to make with regard to the meeting, although some reports have circulated that it will hold a simultaneous “counter-meeting.” That also seems unlikely. It probably feels that it is poised to pick up the pieces if and when the meeting implodes or is not held. It is presumably more focused on Israeli Defense Minister Barak’s oft-repeated threats to invade Gaza, the power cuts recently imposed, and playing the sympathy card, and so violent reactions would likely be counter-productive. The US is virtually a party to the Israeli-Palestinian conflict. While it has almost always been sympathetic to Israel (President Eisenhower’s attitude during the Suez Crisis of 1956 being a notable exception), beginning in the Reagan Administration and continuing under Clinton and G.W. Bush the two countries have been seen as nearly inseparable in policy terms and in attracting the same enemies. Likewise, one of the main denunciations of the US, especially in the Arab and Muslim worlds, has been that it is a pawn of Israeli policy. At the same time, it is generally recognized that Israel only trusts the US. No other country could “deliver” Israel, whatever that would mean in practice. It is clear that there is a major division in the administration. Secretary Rice, generally supported by Secretary of Defense Gates, is emphasizing diplomacy with the Annapolis meeting as the centerpiece, while Vice President Cheney is the main proponent of more forceful solutions, perhaps including a strike on Iran. Cheney has been virtually invisible with regard to Annapolis, which proves nothing whatsoever with regard to what is happening at the highest levels. It can also be assumed that Elliott Abrams, Deputy Director of the National Security Council and the White House’s point man on the Israeli-Palestinian conflict, is not a fan of the meeting. Although he has apparently not made public statements on the issue, he assured a group of Jewish leaders in May that Israel would not have to make unacceptable compromises. The fact that President Bush leaves office on January 20, 2009 and now leads a politically weakened and unpopular administration has significant implications for Annapolis. If he were to work with Secretary Rice and exert the influence of his office on both sides for an agreement based more or less on the Clinton parameters, it is conceivable though by no means assured that an agreement could be reached. But, given his personal style and political constraints, it is unlikely that he will play a major role. Reports are that he will not come to Annapolis but will invite participants to a dinner at the White House. Israel is a major subtext in American politics and thus in the presidential primary process, in full swing through 2007. All of the major candidates proclaim full support for Israel, especially to Jewish groups and to Christian fundamentalist audiences. On the Republican side, there is the additional constraint of candidates concerned with the need to hold on to the evangelical Christian base, which is disappointed in various ways with the current administration. Some of its leaders have even threatened to bolt the party if former New York City Mayor Rudy Giuliani, perceived as too liberal on “values issues” is nominated. Strong support for Israel, including its control of the West Bank, which is often understood by the Christian Right in both theological and strategic terms, is thus perceived as an essential element that all Republicans will likely agree on in order to avoid antagonizing this base further. Pressure on Israel from a Republican president would thus not be welcomed by the party. There is also the much-discussed issue of “legacy.” Were the meeting to succeed, Secretary Rice and President Bush could hope it would provide some counterweight to defining Iraq as the main emblem of the Bush Administration. But the political factors seem to militate against a strong effort that might require pressure on both sides. Success: Impossible or Merely Elusive? As shown above, at first blush, the Israelis and Palestinians have little chance for coming up with a comprehensive peace deal, such as was envisioned at Camp David II in 2000, or as actually occurred at Camp David I between Israel and Egypt in 1977. Secretary Rice must be assumed to be aware of this. What is she trying to accomplish? It is suggested above that Iran is the subtext for the meeting, although this has never been mentioned by any of the meeting’s proponents. Even if true, there has to be some movement on the ostensible reason for the meeting, both to bring the desired guests and to encourage them to act. As November began, there was a flurry of discussion of the long-dormant Road Map which puts Israeli security concerns, Palestinian institution-building, and dismantlement of Israeli settlement “outposts” first, and the establishment of a Palestinian state last, sandwiching a “state with provisional borders” in between. Apparent agreement between the two sides on implementing the first phase of the Road Map seems to have opened the door to agreement on a compromise joint declaration before the meeting begins. The new buzzword is “process.” As Israel has been insisting, it now seems impossible that major substantive breakthroughs can be reached at the meeting itself. It appears that the meeting itself will be a one or two-day affair. Focus has shifted to establishing a process according to which negotiations will be conducted, presumably under American auspices, to reach agreement on the core substantive issues before Bush leaves office. As noted, a Palestinian demand for a six-month negotiating deadline was turned down by Secretary Rice. If a post-meeting process is in fact to be set in motion, then this might well provide a face-saving reason for Arab states to show up. Even if nothing is specifically on the table, then at least nothing is off the table, according to Prime Minister Olmert. The Saudis will not want to disappoint the President and Secretary of State of the United States. Such a process, especially if some sort of deadline is imposed, might be sufficient to save the meeting from the taint and consequences of failure. And the failure of a “process” down the road would be less obvious than the implosion of a conference, such as happened at Camp David in 2000. According to reports, Prime Minister Olmert has moved into high gear by insisting that the outstanding issues can and will be settled. One PA official blamed Foreign Minister Livni, usually considered more dovish, and Defense Minister Barak for lack of progress, insisting that only Olmert could and would break the deadlock. Olmert is projecting a brisk, can-do attitude. But all this is largely atmospherics. There is no indication that the two sides have done the essential preliminary work of getting their societies to compromise on the fundamental issues that divide them. No one can seriously imagine that Olmert, even if he were able to eke out a government or Knesset vote in his favor, would risk splitting the country by carrying out the evacuation of dozens of settlements and thousands of settlers that would be necessary to create a contiguous, viable Palestinian state. Even were that to happen, it is almost as hard to imagine President ‘Abbas’s government agreeing to a complete renunciation of the Right of Return. Solutions that have been suggested, such as those set forth in the sidebar on page 7 of this Policy Brief, require a slow and consistent policy that would change public opinion over time. Equally thorny is the issue of Israeli security. Despite new deployments of police in territories under its jurisdiction, the PA is uncomfortably and unhappily dependent on the Israeli army to ensure that there is no armed action, whether denominated coup or rebellion, which might topple it as easily as the PA was toppled in Gaza in June. It is not clear that Annapolis was formulated with a strategy for overcoming these problems. However, at this point, as preparations are moving swiftly, it may be that Rice is hoping to short-circuit the deep-rooted societal skepticism of peace and distrust of the other side by having the leaderships, together, leap well beyond where they have ever gone before. The question is whether their governments, legislatures, and societies (which will either explicitly or implicitly have to ratify the agreement) will similarly agree to suspend their disbelief in the credibility of the other side, honed by decades of disappointments. One of the many truisms of Israeli-Palestinian negotiations is that the higher that expectations are raised, the deeper they fall if they fail. Thus, Rice and Olmert, and perhaps ‘Abbas, are taking a serious gamble with optimism. ‘Abbas, whose government and society are weakest, has the most to lose. The skeptics have had a field day with this meeting. It was promised for the fall, which ends on December 22. Secretary Rice has until then, at the latest, to prove them wrong.
. It is officially denominated a meeting, not a conference, so as to emphasize that the bargaining will not take place there.
. See David Brooks, “Present at the Creation,” The New York Times, November 6, 2007.
. See the Peace Index for September and October 2007, Dr. Ephraim Yaar and Dr. Tamar Hermann, Tami Steinmetz Center for Peace Research of Tel Aviv University, www.tau.ac.il/peace.
. Karen DeYoung, “In Mideast, Rice Pushes Annapolis Talks,” Washington Post, November 5, 2007, p. A14.
. Poll by the Palestinian Center for Policy and Survey Research (PSR), directed by Dr. Khalil Shikaki, September 10, 2007, http://www.pcpsr.org/survey/polls/2007/ps5e1.html#main. Dr. Shikaki’s polls are highly respected, though he underestimated the support Hamas would receive in the elections that brought it to power in 2006.
. For statistics on the checkpoints, see http://www.btselem.org/english/Freedom_of_Movement/Statistics.asp. For statistics on the barrier, consult http://www.btselem.org/english/Separation_Barrier/Statistics.asp.
. See Zvi Bar’el’s article in Ha’aretz, “Annapolis summit will bring Hamas back into the fold,” October 21,. 2007, http://www.haaretz.com/hasen/spages/915137.html.
. Amos Harel, “Hamas losing grip on Gaza, Fatah gaining support,” Ha’aretz, November 13, 2007, http://www.haaretz.com/hasen/spages/923553.html.
. See for example, Nadav Shragai, “Envisioning a divided Jerusalem,” Ha’aretz, October 17, 2007, http://www.haaretz.com/hasen/spages/913665.html.
. The opposition that this approach may engender can be seen in a report of his speech by “Arutz Sheva,” which is affiliated with the Jewish settler movement. See http://www.israelnationalnews.com/News/News.aspx/124140.
. See the 2003 poll by Policy Survey Research (PSR), “Results of PSR Refugees’ Polls in the West Bank/Gaza Strip, Jordan, and Lebanon on Refugees’ Preferences and Behavior in a Palestinian-Israeli Permanent Refugee Agreement, January-June 2003” at http://www.pcpsr.org/survey/polls/2003/regufeesjune03.html.
. Paul Scham, “The Historical Narratives of Israelis and Palestinians and the Peacemaking Process,” Israel Studies Forum, Vol. 20, No. 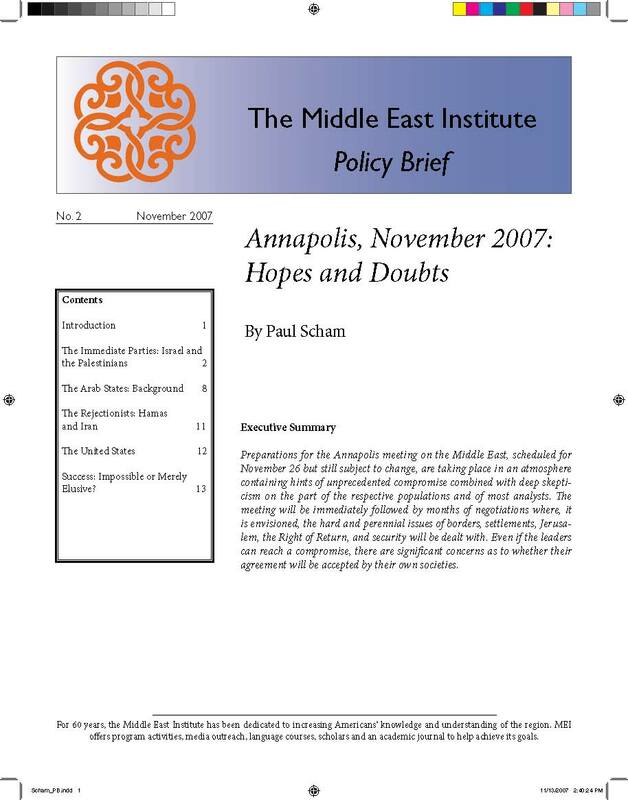 2 (November 2006).
. Annapolis is a Trap Set by the Zionists,” Jerusalem Post.